Before I went to Kuala Lumpur (KL), the only thing that I knew about KL was the Petronas Towers. In Japan, there is very little information on things to do in KL itself so I had little to go on. I did research on the internet in English and did find one thing to do. I found an area called Batu and it is famous for the Batu Caves. It is an old Hindu shrine that is situated inside a mountain. It is considered one of the most important Hindu shrines outside of India. It was a beautiful place to visit when I went and quite memorable. Unfortunately, it was difficult to get there and with the heat in Malaysia, difficult to get around. I do recommend spending a couple hours to go out there and look around. It shouldn’t take more than two to three hours to go from central KL to the Batu Caves. The first thing people must do is get to the Batu Caves. 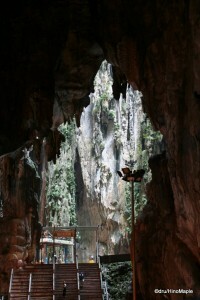 The Batu Caves are located on the northern edge of KL. It is pretty easy to get to the Batu Caves. From KL Sentral, you take the KTM Komuter to the last stop, the Batu Caves. It is pretty cheap too. It costs just RM1 to go to the Batu Caves, but it costs RM2 to return. It is very strange to hear that but if that’s the cost, there is nothing you can really do about it. I was pretty surprised to hear that it cost RM1 to go to the Batu Caves but I wasn’t about to complain at all. The train to the Batu Caves was pretty good. We were lucky and caught one of the new trains. It is important to note that the KTM Komuter trains have a women only car. While for women, this isn’t a problem, but for men it can be a problem. The new trains are really nice and clean but the train I got onto said it was headed to the Batu Caves. I read that when you go to the Batu Caves you have to change at Sentul Station, but since the signs all said Batu Caves, I was under the impression that I could go there on one train. I was wrong as at Sentul the train stopped and they said the train to the Batu Caves was cancelled. Thankfully someone who worked there walked up to us and said the train to the Batu Caves was across the platform and we hopped on and got to the Batu Caves. The biggest problem about the train to and from the caves was the speed. For a mass transit, the train was painfully slow. It felt as if I could ride a bicycle faster than the train but again, for RM1, I can’t complain. The Batu Caves are very interesting and great to look at. I walked around some of the shrines and temples on the main level just outside the caves themselves. There are some very interesting statues everywhere. I enjoyed taking photos of all the gods but I didn’t find it as interesting as I imagined. After I visited Singapore last year, I saw a few Hindu temples and I became accustomed to what I would be seeing. It was nice to see but it wasn’t new for me. The size, however, was much grander and added to the majesty of the caves themselves. The main Batu Caves are free, but there is also a paid section as well. I believe the paid section is more of an entertainment section, so I didn’t bother to go. The main cave is located about 210 steps up from the base. You start out at the base near the train station and start a short hike up the steps. Once you reach the top of the steps, you are at the main cave. From there, you just walk through the main cavern into a rear cavern. The rear cavern has a natural opening at the top to allow light in as well as to see some of the jungle above. It is a very interesting place to visit, but unfortunately I wasn’t feeling well when I went so I didn’t enjoy it as much as I would have liked. The Batu Caves is not just about Hinduism. It is also about monkeys. 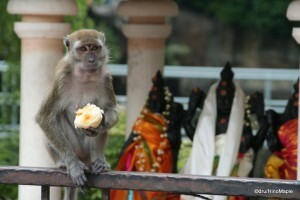 There are several macaque monkeys that live around the Batu Caves. These monkeys can be a little dangerous when you are visiting the site. Many people feed the monkeys so they hang around the entrance to the main cave. Most of the monkeys will hang out around the base of the stairs but they can be anywhere from the base all the way up to the entrance of the cave itself. Generally they are just eating whatever people give them, or whatever they can steal. The monkeys can be very sly so you must be careful with what you have. While I was walking up the stairs, a European man had a bottle of water stolen from him by a monkey. The water was in a side pocket in his bag. The monkey jumped up on his back and grabbed the water. It was funny to hear his screams but at the same time a little worrying for me as I didn’t want them to steal my own water. I would advise that you keep everything you have zipped up in your bag to prevent it from being stolen by the monkeys. If you do have little children, it would be best to keep them under a close eye. The monkeys may bite if they feel their territory is threatened. Generally they are okay and will just steal food from what I saw but with children you never know what will happen. 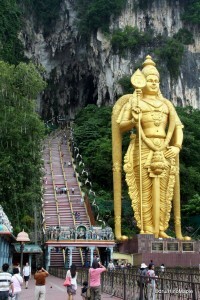 The Batu Caves are a place that you should visit, especially if you have never been to a Hindu shrine in your life. Coming from Vancouver, there are many Indo-Canadians but there are no Hindu shrines that I know of. Sikhism is popular but Hinduism isn’t as popular. I don’t know much about Hinduism but it is very interesting to see what the shrines are like. Even for someone who doesn’t believe in Hinduism, the statues of the different deities and gods are worth the visit. If you are lucky, you will be there during one of the services. I was not there during any service but in Singapore I did hear one of the services. It is very noisy with lots of instruments being played. It sounded crazy but interesting. While I would not like to visit the Batu Caves again, I have no regrets for going to the Batu Caves. If I do go to KL again, I won’t go to the Batu Caves but I will suggest that any of my friends who do go to KL should visit the Batu Caves. 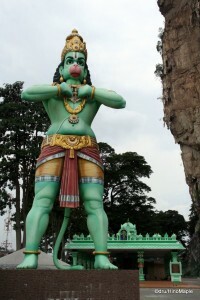 This entry was posted in East Asia and tagged Batu, Batu Caves, cave, Hindu, Hindu Shrine, Hinduism, KL, KLSentral, Komuter, KTM Komuter, Kuala Lumpur, macaque, macaque monkey, Malaysia, monkey, Sentul Station, shrine, Sikh, Sikhism by Dru. Bookmark the permalink. So … the cave is quite big? It doesn’t make you feel claustrophobic? I don’t know why I wasn’t feeling well. I had a stomachache and felt I had mild food poisoning. Could have been heat stroke too. It went away when I got back to Tokyo the next day. Dunno what happened. Behind the caves? Sounds nice. Still don’t know how you survive living in that heat so often… Add the crowds during Thaipusam and I think I’d die. I kinda wish I was there for the festival but at the same time, glad it wasn’t so busy. Not really. Traffic jam is a nightmare there. But there are plenty of townships and modern villages surrounding the Batu Caves. I went there as a little girl and can remember being freaked out by the creepy statues.